Photo sourced from Fierce Healthcare. It took more than 10 minutes for paramedics to arrive after a housekeeper found a man collapsed on the floor of a bathroom in a Boston Veteran Affairs building. The paramedics immediately administered naloxone, often known by its brand name Narcan, to successfully reverse the man’s opioid overdose. But it takes only a few minutes without oxygen for brain damage to begin. Pam Bellino, patient safety manager for the Boston VA, read that incident report in December 2015 with alarm. “That was the tipping point for us to say, ‘We need to get this naloxone immediately available, without locking it up,’” she said. The easiest way to do it quickly, Bellino reasoned, would be to add the drug to the automated external defibrillator, or AED, cabinets already in place. Those metal boxes on the walls of VA cafeterias, gyms, warehouses, clinic waiting rooms and some rehab housing were installed to hold equipment for a fast response to heart attacks. Now the VA, building on the project started in Boston, is moving to add naloxone kits to the AED cabinets in its buildings across the country, an initiative that could become a model for other healthcare organizations. Equipping police with nasal spray naloxone is becoming more common across the country, but there has been some resistance to making the drug available in public. Bellino has heard from critics who say easy access to naloxone gives drug users a false sense of safety. She disagreed. Giving naloxone to someone who hasn’t overdosed isn’t harmful, but it is a prescription drug. So, Bellino said, the VA had to persuade the accrediting agency, The Joint Commission, to approve guidelines for the AED naloxone project. The cabinets must be sealed and alarmed so staff can tell if they’ve been opened. They must be checked daily and refilled when the naloxone kits expire. In December, the project will expand nationwide, as VA hospitals across the country will add naloxone to their AED cabinets. Vets have nearly twice the risk of overdose, compared with civilians, said Amy Bohnert, an investigator with the VA Ann Arbor Healthcare System, citing 2005 death data. She said it isn’t clear why veterans are more likely to OD, but many do have complex medical conditions. A smattering of schools, airports, churches and employers around the country have added naloxone to their AED cabinets. Some stock other lifesaving tools as well: tourniquets to stop bleeding after a shooting; EpiPens to keep airways open; and even injectors to treat diabetic shock. Dr. Jeremy Cushman leads a project at the University of Rochester that has placed both tourniquets and naloxone in 80 AED cabinets across that campus as of July. Turning AED cabinets into miniature emergency medical stations presents challenges, Cushman said. Medicines can’t be left outside during extreme temperatures. They are expensive and expire. Dr. Scott Weiner, president of the Massachusetts College of Emergency Physicians, said he has dealt with those issues while developing street-level dispensing stations for naloxone. And then there’s the belief among some critics that naloxone enables drug use by offering an assurance of life after an overdose. Weiner said that attitude is waning and as it does, the public may be more open to other controversial, lifesaving measures. 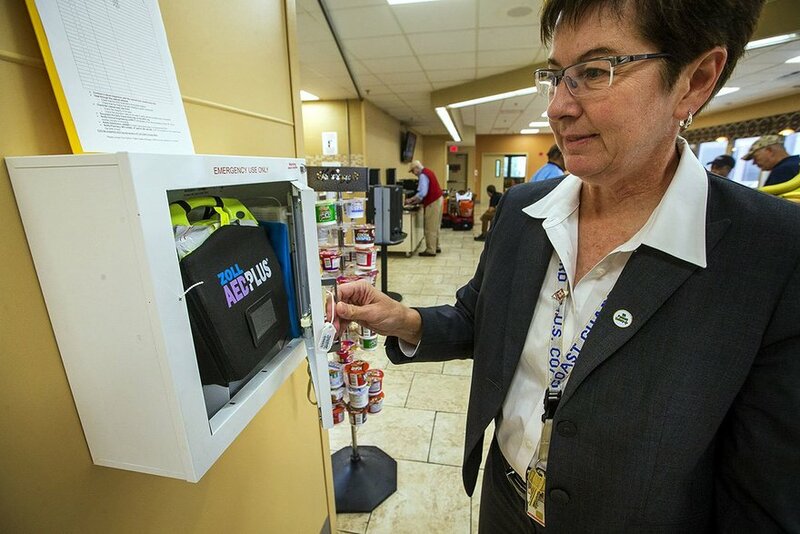 The Boston VA’s Bellino said she hopes that AED manufacturers will start selling cabinets that meet the new hospital accreditation standards. So far, the Boston VA counts 132 lives saved through all three parts of its naloxone project: training high-risk veterans, equipping police and the AED cabinets. This story is part of a reporting partnership that includes WBUR, NPR and Kaiser Health News. Kaiser Health News is a nonprofit news service covering health issues. It is an editorially independent program of the Kaiser Family Foundation that is not affiliated with Kaiser Permanente. Request a product presentation or contact us to learn more about how assessURhealth™ can help your facility generate revenue, gain valuable patient health data, and reduce staff resources. If you are seeking personal or individual help please dial 911 for an emergency or call the National Suicide Prevention Lifeline at 1-800-273-8255. Please see our resources page for a list of government and non-profit mental & behavioral health organizations. assessURhealth™ is an electronic, mental & behavioral health screening tool that generates additional revenue and helps save lives.